London Hotels, Guest houses and bed & breakfast accommodation in around near Muswell Hill all with real-time, confirmed online reservations. Muswell Hill is an area in the London Borough of Haringey in London, England. It is a suburban development situated 6.2 miles (10 km) north of Charing Cross. Muswell Hill is in postal district N10 and the area is mostly in the Hornsey and Wood Green constituency. The Raglan Hotel is situated in an elegant, quiet tree lined avenue in north London with excellent access to the major road and rail networks. You will be pleasantly surprised by the size of the 48 light and well- appointed bedrooms in the comfortable, three star Raglan Hotel. There are also many other amenities in this friendly yet professional environment, conveniently situated in the heart of North London's cosmopolitan Muswell Hill. Raglan Hotel can offer a wide range of services including magnificent conference and banqueting facilities in the newly refurbished Garden and Raglan Suites. Whether you are organising a wedding reception or a corporate gathering, we will take care of everything down to the smallest detail. Furthermore, Raglan Hotel has a partnership with nearby amenities such as Muswell Hill golf course and can arrange for guests to be involved in many other local activities. At Raglan Hall Hotel, we offer two very special bonuses: our own secluded private garden (with a relaxing patio area) and Flutes, an elegant, air-conditioned restaurant recognised for its imaginative, modern British food, attentive service and lively Sunday jazz brunches. 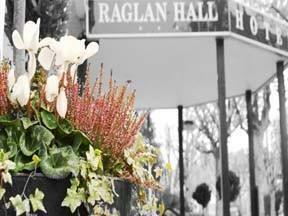 Whatever your needs, Raglan Hotel has the answer.